As the Sanctuary of the Great Lakes, Alpena truly embodies a haven from the stresses of everyday life. It is a culturally rich place to relax, rejuvenate, and inspire the happy, healthy, and creative you. In Alpena you’re never too far from a WiFi connection – or a woodland trail. We are that place where history and heritage collide with relaxed outdoor adventure. Taste and enjoy locally-made wine with friends at a country winery or visit a local brewing company, where beer and soda are on tap for the tasting. Enjoy hot coffee and conversation at a downtown café, or dinner at a historic saloon that once catered to rough and ready lumberjacks. 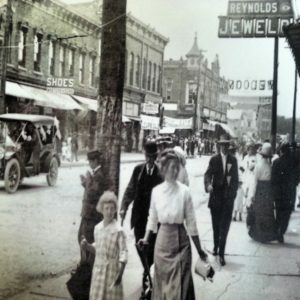 An attractive downtown area, enclosed shopping mall, antiques mall, and a variety of major chains offer the visitor tempting options for both shopping and dining. Motels, bed and breakfasts, resorts, cabins and campgrounds offer a wide range of accommodations, amenities and inviting extras. Miles upon miles of city and country trails, acres of fresh clean lakes and rivers, and hundreds of warm friendly smiles await you in this community that has all the conveniences and technology of a major-metropolitan area, without the congestion and stress. 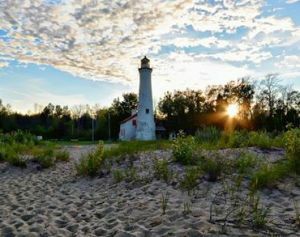 Take a look at the Alpena’s Top 10 Adventures to find inspiration for your visit to the Sanctuary of the Great Lakes. The historic port city of Alpena sits nestled between a vast emerald forest and a clear blue bay. Founded in 1871, Alpena began as an early commercial fishing port and soon grew to be one of the nation’s most profitable lumber harvesting locations. Lumber camps dotted the region, and logs were floated down the Thunder Bay River to the harbor where they were sawn and/or loaded on ships to help build the rest of the nation. The first commercial harvest of timber began during the winter of 1858-59. At it’s peak, Alpena shipped out billions of board feet of lumber. Alpena was a thriving port ushering between 1,500 and 2,000 ships in and out of Thunder Bay annually. 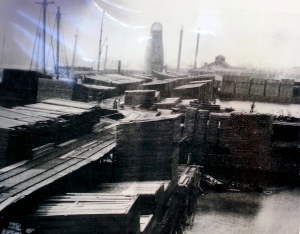 Lumber piles line Thunder Bay River in Alpena c.1885. From lumbering, Alpena moved into other ventures such as manufacturing and mining. Alpena is home to one of the world’s largest shale quarries, Lafarge North America – Alpena Plant. Shale and limestone are extracted from the earth and mixed with other ingredients to make raw cement which is shipped out from Alpena via freighters on the Great Lakes. Alpena is also home to the world headquarters of Besser Manufacturing Co. In the early 1900s, Alpena residents Herman Besser and his son Jesse revolutionized the concrete building industry with the invention of advanced concrete block making machinery. Today Besser company continues to supply the world with modern versions of this machinery. Additionally, you will find the United States’ only freshwater marine sanctuary here in Alpena. Thunder Bay National Marine Sanctuary protects hundreds of shipwrecks resting on Lake Huron’s floor. Divers, snorkelers, kayakers, history buffs, and everyone in between venture to Alpena to learn the story these wrecks share. A state-of-the-art regional medical center, community college, strong business climate, and community oriented infrastructure make Alpena an ideal location for business, vacation, and residency. For more information about the history of Alpena and the local area visit the Alpena County George N. Fletcher Public Library.